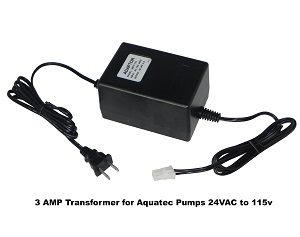 * This is 3A transformer is much better than 2Amp or 1 Amp transformer when you are operating at higher pressure, longer run time, or you attached other switch, sensor, solenoid valves to the pump. Higher Amp prevent over heating, burn out. Longer service life. * Input voltage is USA 115VAC 60Hz, and the output is 24VAC.